Designing the instruments and controls for BLOODHOUND SSC is an ongoing process. We’re still refining the details of the various systems: electrics, hydraulics, engine start and control systems (for all 3 engines – the EJ200 jet, rocket and the high performance race car engine), safety monitoring, etc. Once that’s complete we can finalise the design of the cockpit instruments. In the meantime, what we can do is test some ideas with various ‘simulators’ and ‘emulators’ (in simple driver terms, a simulator is designed to make the driver think that he/she is in the car and an emulator is designed to make the car’s systems think that they’re in the car – a small but important difference). The first part of this process starts with a ‘BLOODHOUND Driving Experience’, which has already proved hugely popular with the public and of course with our schools audiences. The purpose of the ‘Driving Experience’ is to give you (and me!) 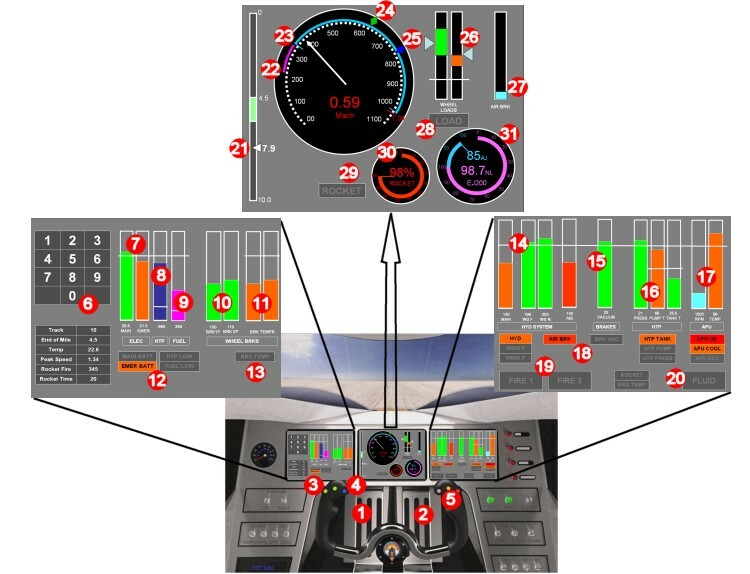 a first look at driving BLOODHOUND, using prototype instrument designs, a realistic performance model and some high-quality graphics. To produce this, we had help from Intel, together with Cursive Simulation and the Race Centre in Southampton. The Driving Experience will not be a simulator as such. A proper simulator for BLOODHOUND SSC would take hours of study just to understand how it worked, then perhaps 20 minutes to get all the systems up and running and the engines started, and there would be plenty of little snags to look at – any one of which could stop the car running. All in all, it would be a technically complex, time-consuming and occasionally frustrating experience – just like the real thing! Instead, the Driving Experience will give you a chance to jump in and have a go at a 1000mph run, without too many ‘real-world’ problems. You will have to control the jet and rocket power, accelerating each one at the right rate and the right time, while you try to keep the car straight against the virtual effects of cross-winds, surface changes and so on. So what instruments is the Driving Experience going to have? The picture describes the current instrument layout and the basic functions of each one. When you are in the Driving Experience, you will see a number of these moving at the same time – such as temperatures and pressures – but the good news is that none of them will fail at any stage (it’s not a simulator!) so you can ignore everything except the gauges on the centre screen. If you are a real lead-foot on the brakes, you might also need to look at the brake temperatures at the end of the run, to avoid setting fire to them…. Keep steering all the way to the end of the measured mile! Wheel brakes below 200 mph (left pedal) to stop the car next to them. Jump out and celebrate a successful run – Simple! Hover your mouse over the numbers to find out what all the labelled controls and instruments do. You’ll need to know some of this before you have a go in the BLOODHOUND Driving Experience – then come and give it a go at one of the future BLOODHOUND events! 8. HTP quantity – this will read about one tonne at start up: enough for 20 sec of rocket firing! 26. Loads on the front and rear wheels. These wheel loads are the most important safety element in the Car. If these stay within limits, then all will be well – so I’ll be watching them closely! There has been lots of fantastic work done at Bloodhound SSC Sponsor URT Group Ltd over the last few months and the carbon composite monocoque has now been manufactured. Here is the story and pictures of how this was done. Lots of people were gathering again at the University of the West of England today, people from the University, a couple of sponsors, BLOODHOUND SSC team members, press people … and a bunch of very enthusiastic students.